ICAN has obtained declassified diplomatic cables, ministerial briefings and emails under freedom-of-information laws, which show that the Australian Government plans to oppose efforts to ban nuclear weapons. “Our freedom-of-information research has shown that Australia is worried that the increasing international focus on the humanitarian impact of nuclear weapons will lead to negotiations on a treaty banning nuclear weapons,” ICAN Australia Campaigns Director, Tim Wright, told IDN. The former Labour government did not endorse the 80-nation humanitarian statement delivered at the Nuclear Non-Proliferation Treaty (NPT) Second Preparatory Committee meeting held from April 22 to May 3, 2013, in Geneva. ICAN is calling on the current Liberal-National coalition government to play a more constructive role in Disarmament. "Australia should stand on the right side of history, rather than attempting to undermine the efforts of progressive nations to ban and eliminate nuclear weapons,” said Wright. In October 2013, another statement on the humanitarian impact of nuclear weapons was delivered to the 68th session of the UN General Assembly First Committee by New Zealand on behalf of 125 nations. “Unfortunately, not only did Australia fail to sign this statement, but it introduced its own rival statement designed to steer governments away from a ban on nuclear weapons. The much weaker statement by Australia was endorsed by just a small number of US allies, and had little impact. We were pleased that the New Zealand-led statement attracted the support of a large and diverse number of governments committed to delegitimising the use and possession of nuclear weapons,” Wright told IDN. Proponents of nuclear abolition find it disappointing that Australia appears desperate to thwart the efforts of many countries to highlight the devastating effects of nuclear weapons and the need to ensure they are never used again. Nuclear weapons, despite having the greatest destructive capacity of all weapons, are the only weapons of mass destruction not yet prohibited by an international convention. The disarmament movement received a boost with the International Red Cross and Red Crescent Movement adopting a resolution to work towards a legally binding global convention on nuclear abolition. Professor Ramesh Thakur, Director of the Centre for Nuclear Non-Proliferation & Disarmament at the Australian National University, is of the opinion that there was no compelling case for Australia to have maintained distance from the NZ-led statement. “By being seen to be disagreeing, Australia is undermining ongoing efforts in other respects. At about the time of the NZ statement, Gareth Evans and I were engaged in serious efforts to convince the policy elite in India and Pakistan (and earlier in China, Japan and South Korea too) about steps that each country can take on its own to generate some serious momentum for nuclear arms control and disarmament (for example ratifying the CTBT (Comprehensive Test Ban Treaty) without first waiting for the US Senate to do so),” Professor Thakur, a former UN Assistant Secretary-General, told IDN. Most Australians are overwhelmingly opposed to nuclear weapons. As ICAN’s International Steering Group Co-chair, Associate Professor Tilman A Ruff, said, “Australians would like to believe that their government is one of the 'good guys' on nuclear disarmament. The bitter reality is that because of its willingness to support and assist deployment, targeting and potential use of US nuclear weapons, Australia is more part of the problem, holding back disarmament, than it is working for the solution”. In1995 Australia’s then foreign minister had argued that a total ban on landmines was impractical and would never be accepted. This was two years before the Ottawa Treaty banning landmines opened for signature. "To make matters worse, Australia's increasing military involvement with the US is making particularly the huge and expanding military spy base at Pine Gap near Alice Springs an even higher priority nuclear target in the event of any war the US gets embroiled in with China or any other nuclear armed state,” Ruff, who is also co-president International Physicians for the Prevention of Nuclear War, told IDN. New Zealand's healthy and growing defence cooperation with the US makes plain that it is perfectly feasible for countries to have a military relationship with the US which excludes nuclear weapons. “Pursuing such a path would be the best thing Australia could do to actually help in freeing the world from nuclear weapons," Ruff added. Advocates for a nuclear free world argue that a global ban on nuclear weapons can be achieved through sustained public pressure and leadership from governments. Former Prime Minister Malcolm Fraser, who was critical of Australia’s decision not to endorse the humanitarian statement, is of the view that the current Australian Government may wish to please the US even more than the previous government. A spokesperson for the Department of Foreign Affairs and Trade (DFAT) told IDN that Australia had welcomed the New Zealand statement and it shares most of the sentiments expressed in it, “but we were not in a position to support this statement which was prepared without giving us an opportunity to contribute substantively and did not appropriately acknowledge the security dimensions of the debate. We remain committed, as a long time and active advocate of disarmament, to achieving and maintaining the shared goal of a world free of nuclear weapons”. Australia is in an interesting situation because as a country it does not have any nuclear weapons, but it subscribes to the doctrine of extended nuclear deterrence under the US alliance, which is seen as key to Australia’s national security. It also has almost 40 per cent of the world's known uranium reserves and it is a significant exporter of uranium. Today, there are at least 20,000 nuclear weapons worldwide, around 3,000 of them on launch-ready alert. The potential power of these would roughly equate to 150,000 Hiroshima bombs. The focus is moving from non-proliferation to abolition and Australia is concerned that it could shift the focus away from the nuclear-weapon states and Iran to US allies, such as Australia, that subscribe to extended nuclear deterrence. In March 2013, the Norwegian government had hosted a landmark inter-governmental conference in Oslo on the humanitarian impact of nuclear weapons, which was attended by 128 governments (including Australia) and representatives from major UN agencies and the International Red Cross and Red Crescent Movement. In the lead-up to the NPT preparatory committee meeting, South Africa had invited all parties to the treaty to endorse a two-page statement calling on all states to “intensify their efforts to outlawnuclear weapons and achieve a world free of nuclear weapons”. Australia did not endorse the statement. The growing unity of civil society working on weapons-related issues was reflected in the Humanitarian Disarmament Campaigns Forum hosted on October 19 and 20 in New York. Mexico will host a conference of states, civil society and academia in February 2014, which will be a critical next step in acknowledging and responding to the humanitarian consequences of nuclear weapons. 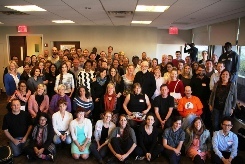 Top photo: Campaigners at the Humanitarian Disarmament Campaigns Forum in New York.